We recently teamed up with Table Matters and Lolo French Antiques to create some holiday magic. Let us show you how to bring your a-game when it comes to table-setting during this holiday season through a couple easy to follow holiday hacks! We love designing tablescapes that compliment the existing interiors of our clients’ homes. Together with Mimi Montgomery of Lolo French Antiques, we dreamed up this blushy tablescape to showcase her exquisite limoge plates and heirloom silver. To anchor the table we draped champagne hued garland with a touch of glitter down the center of the bleached pine antique table. We used two 4 foot pieces of garland so we’d have enough to encircle the centerpiece as well as hang off the sides to create that lush, dreamy feel. DESIGN TIP: By using faux garland you don't have to worry about the garland looking dehydrated after a couple of days or all the mess the fallen needles creates. Not to mention the sparkling touch is oh so chic! From there we layered in bottle brush trees and rope tapers in antique silver candle holders to add some visual interest through height variations. Next, Mimi did a stunning mix of modern and antique tableware for the dish stack. “You can’t go wrong with a mix of modern and antique tableware, or high end and low end. Mix Limoges with Pyrex like we did! We played around with my china and crystal and swapped plates and glasses and candlesticks in and out many times before we settled on what we used” said Mimi. To top it off in a beautifully festive way we adorned each dish stack with gorgeous gold/blush pleated metallic napkin with a chandelier spray napkin ring from Table Matters. For the final touches we placed pale pink peonies, silver brunia and gumball pink hypericum berries in three inch clear floral water tubes and tucked them into the limoge fruit bowl centerpiece. 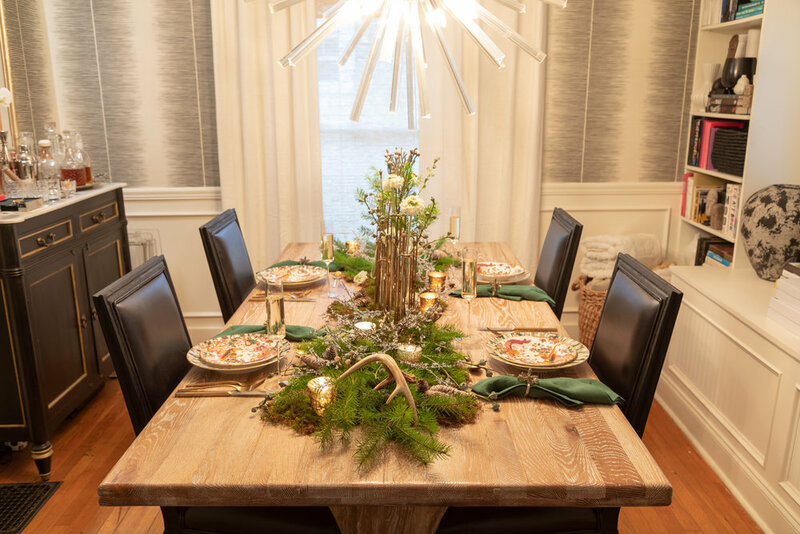 A warm and inviting dining room for the holidays is a must! Together with Patricia Murray of Table Matters, we created this tablescape to showcase their handsome dishes and unbelievably cool hinged flower vases in antique brass. With this tablescape it was all about layering in smoky-bronze-meets-deep-tabacco accents as well as natural pieces like antlers and fraser fir branches (we got our holiday branch bundle from our local Trader Joe’s). We started out by patching together moss pieces to create an organic table runner. From there we piled on the fraser fir and pine branches then topped it off with sparkly crystal covered faux branches to add a festive touch! For the accents it was an eclectic mix of modern classics-votives, antlers, bud vases. We were all about bringing in pieces that could easily transition into the New Year. DESIGN TIP: Start in the middle when patching together the moss pieces to create the runner. Once you create the middle section-work from there to take the runner down the left and right side. This way it’s easier to achieve a balanced look. For the dish stack, Patricia paired a stunningly colorful salad plate on top of an unique hand-glazed dinner plate with a matching hunter green linen napkin accented with onyx bead spray napkin ring (all items currently available at Table Matters).